Perched on a cliff in upstate New York, the House in Columbia County is designed to dramatize its relationship to the surrounding landscape. 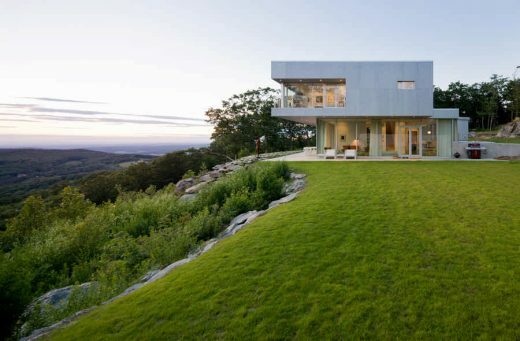 The glazed western façade opens onto stunning views extending fifty miles to the Hudson River, while the eastern façade nestles partially below the nearby woods. The residence is conceived as the interplay of two volumes with two distinct subjects: views of the natural landscape in the lower volume are juxtaposed with views of contemporary art. The lower level consists of living, dining and kitchen spaces. Rather than being self-contained areas, each space flows seamlessly into the other allowing for separation within an overall open plan. Within a central core, a stairway leads upstairs, lit by a skylight from above. Bedrooms on the upper level are organized around the perimeter to capitalize on views and light, while a private library/archive anchors the center providing optimal conditions for objects with higher conservation requirements. Discreet apertures in the upper level, reflecting its specific program and providing privacy, contrast with the fully glazed lower level and respond to the precise position of occupants within the house. 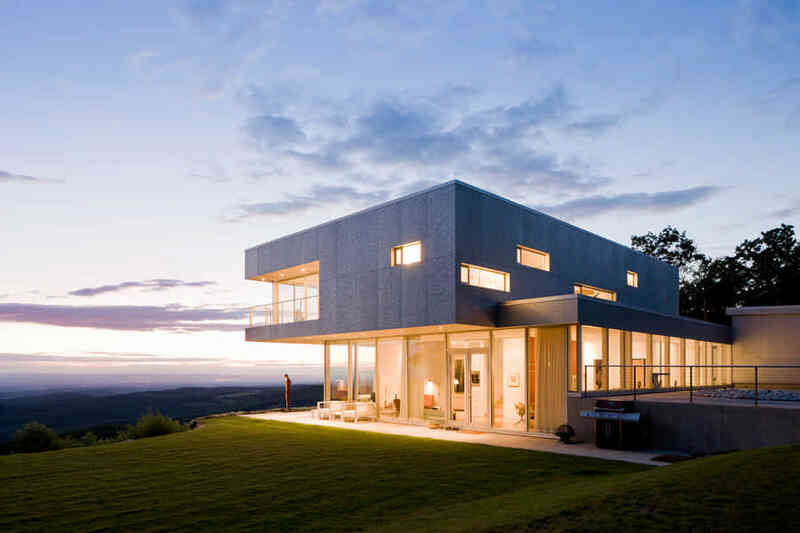 It is a curated house that has artwork by contemporary artists embedded in the house and in the landscape. In contrast to the lower façade, the upper level façade is clad in recycled aluminum, which mutates with the light and captures the dappled pattern of sunlight on the surrounding forest, reflecting the mood of the changing weather. The residential context is a novel one for the unusual and humble material.